A view towards Mt. Adams across flower-filled meadows in Bird Creek Meadows......................August 13, 2007. 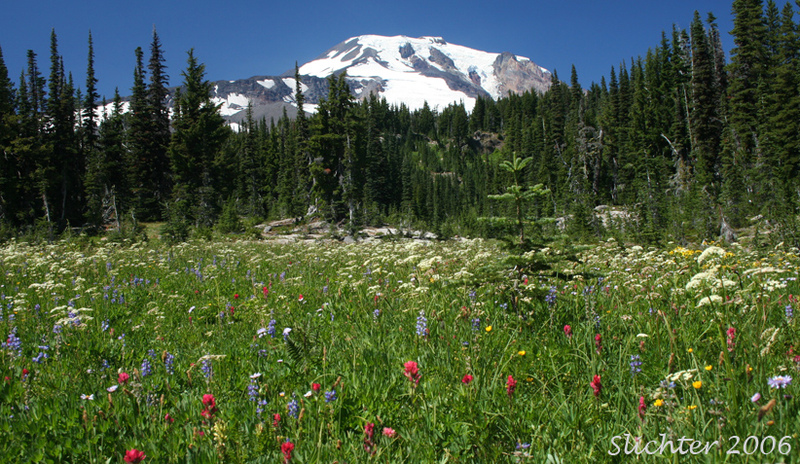 Bird Creek Meadows is best accessed via Forest Road 82 to the north of Trout Lake, WA. Drive north from Troutlake on Road #23 (sometimes referred to as the Mt. Adams Area Recreational Road) for about 1.4 miles to a Y-junction, taking the right fork which is Rd #80. After another 0.6 miles, proceed straight onto Rd #82 (Rd #80 veers sharply left and uphill). Rd #82 is paved and climbs slowly through forest and clear cuts before veering sharply right at the intersection with Rd #8225 (dirt road which runs straight uphill from this intersection). Rd #82 now becomes a high quality dirt road which continues the climb past several snow parks, eventually climbing more quickly past Smith and Bunnell Buttes on the west and King Mt. on the east. At a recently thinned forest area (thinned in 2007), Road #82 veers sharply right at an intersection with Rd #8920 and begins to descend towards the Bird Creek drainage on the east side of King Mt. This is an alternate access road to Bird Creek Meadows, providing access from the Glenwood, WA area. However, passenger cars should avoid this road as it is extremely dusty and very rugged. In addition, there is a chance of running into logging traffic here. To reach Bird Creek Meadows, proceed left on the more travelled Road #8920 from the junction with Road #82. You will enter a clear cut to the east of the road which is the Yakama Reservation boundary. This road climbs past a sign indicating whether Bird Creek Meadows is open (usually not until early July), following the National Forest and Reservation boundary. You will pass the Pine-way Trail #71 trailhead at 4300' and then climb through forest past Snowplow Mt. on the east before crossing Bird Creek (a nice picnic spot with waterfalls). There is a gate at this spot, which will be closed if access to higher locations in the reservation are inaccessible. The road through this section, from the Pine-way Trailhead to Bird Creek Meadows was historically some of the worst on Mt. Adams. I can remember hitting the muffler frequently on this stretch of the road over the last 30 years. The road is increasingly in better shape over the past few years. Evidently, some of the money collected by the Yakamas for camping and daily access permit fees has gone to road improvements. The road is in good shape early in the season, but becomes wash-boarded and rutted and very dusty in stretches. Watch also for large rocks on the road. You will pass Mirror Lake (daily access and camping permits can be purchased here). Mirror Lake has nice wildflower bloom on its banks early in season and an access road proceeds west from this location to the Bird Lake campground. To reach the Bird Creek Meadows trailhead and Bench Lake, proceed straight (north) from Mirror Lake for several more miles. You will reach the Bird Creek Meadows trailhead first. For hikes to Bird Creek Meadows or up the climbers trail to Mazama Glacier, park at this broad parking area. Pit toilets are located at the east end of the parking area under the trees. A permit registration and fee area is located next to the trailhead to Bird Creek Meadows at the northwest corner of the parking area. Permits: Day Permits should be displayed on your dashboard or on the mirror at all Yakama Trailheads for access to Mt. Adams. Campground Permits should be displayed on clips provided at each campsite (Bird Lake and Bench Lake. I'm unclear as to whether camping permits are needed at the climbers camp (Sunrise Camp) accessed via the toe of Mazama Glacier near the head of the Ridge of Wonders. Permits can be purchased at both Bird, Mirror and Bench Lakes as well as the Bird Creek Meadows trailhead (at self service pay sites). Often, one of the Yakama Rangers will collect fees at Mirror Lake (especially on weekends) and these rangers do patrol the roads checking for purchase of the permits and providing information to folks. They will hand out a nice brochure with trails and campgrounds on it upon request. Generally, back country camping is not permitted on Yakama Lands. The Yakamas check Heart Lake in Hell Roaring Canyon each day, requesting campers at that location to relocate to established sites in the 3 major campgrounds. In addition, off trail hiking is not permitted. Stick to well established and signed trails. Water: Water is sometimes available from faucets at the signed picnic area at the loop trail that proceeds uphill to Hellroaring Viewpoint in Bird Creek Meadows. Turn the faucets off when done so they don't run dry (which will happen in dry years). There are many season long streams that pass through Bird Creek Meadows, but I would treat or filter the water before drinking it to guard against contracting Giardia (a very disagreeable stomach parasite!). 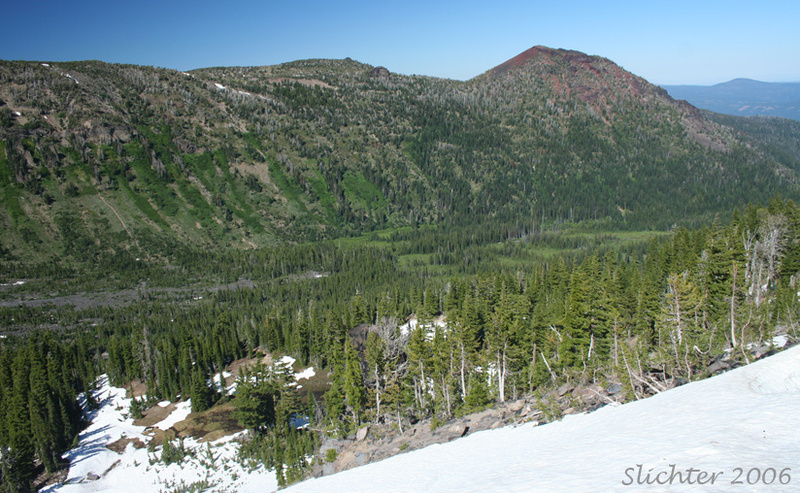 a) Climbers Access Trail to Mazama Glacier: The Climbers Access trail provides a route to quickly reach the base of the Mazama Glacier and hence climbing routes to the summit via Mazama Glacier as well as routes to the Klickitat Glacier. A long, arduous route to Avalanche Valley can also be reached this way by ascending the Mazama Glacier to Sunrise Camp, then descending the Mazama Glacier on the north side of the Ridge of Wonders, crossing the Big Muddy, and finally hiking into Avalanche Valley. The Climbers Access Trail diverges from the Round the Mt. Trail #9 about 100 meters from the Bird Creek Meadows Trailhead. It climbs at first past flower-filled, rocky slopes but then follows the ridge top through open forest, eventually passing the Hellroaring Viewpoint mentioned below. Above the viewpoint, the trail begins to become more faint and hard to follow, but stay to the upper edge of Hellroaring Valley and proceed towards the base of the south lateral moraine of Mazama Glacier. The rock outcrops between the Hellroaring Viewpoint and the base of the lateral moraine have a number of interesting plant species on them, including several rockcress species (Arabis sp. ), Tolmies penstemon (Penstemon procerus var. tolmiei), oval-leaf buckwheat (Eriogonum ovalifolium var. nivale), Hausknecht's buckwheat (Eriogonum umbellatum var. hausknechtii), and small-fruited smelowskia (Smelowskia ovalis var. ovalis). This is also an area where mountain goats can be seen fairly commonly, and a number of alpine birds can be seen from the base of the lateral moraine and above. b) Loop Trails to Bird and Bluff Lakes: This is a nice alternate day trip, especially if it is very windy and rainy on the upper slopes of Bird Creek Meadows as it is more protected by the forest. The trail to Bluff Lake is accessed via the Round the Mountain Trail #9 within a quarter mile of the Bird Creek Meadows trailhead. The trail descends to Bluff Lake and then loops to Bird Lake before climbing along Bird Creek before passing the photogenic meadowed slopes around Crooked Creek Falls (best photographed in the morning, or on lightly overcast days) and returning to the Round the Mt. Trail #9 about one-half mile east of the National Forest boundary. d) Round the Mt. Trail #9 west to the Climber's Trail (above Cold Spring Campground): This is good out and back daytrip, as well as being the only access to Bird Creek Meadows late in the fall when the access road is closed for the winter (about the beginning of October, most years). It's grade is relatively level, climbing slightly at the National Forest/Yakama Reservation Boundary to climb over the upper end of the Aiken Lava Beds. The hike can be done in about 2 hours (one-way) from the Bird CreekMeadows Trailhead, and actually can be hiked further west (I've done it as far west as Horseshoe Meadows). 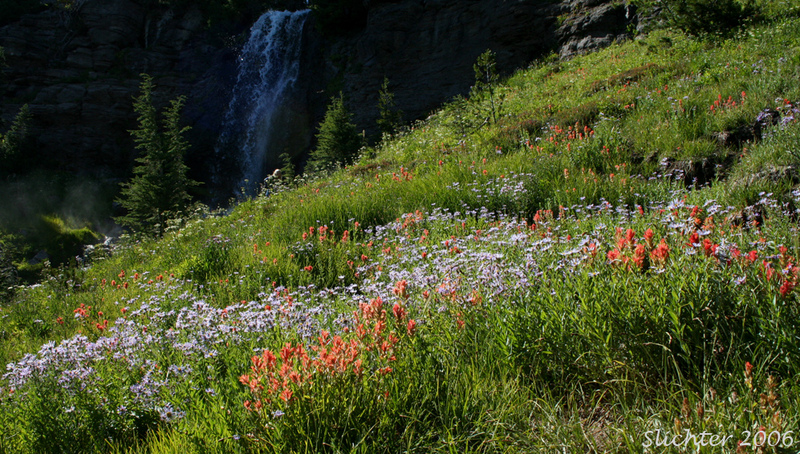 Within Bird Creek Meadows, the trail crosses through many flower filled meadows with numerous photogenic waterfalls and flower-lined streams. July 19 & 21, 2007: Bird Creek Meadows - A Native Plant Society of Oregon hike. 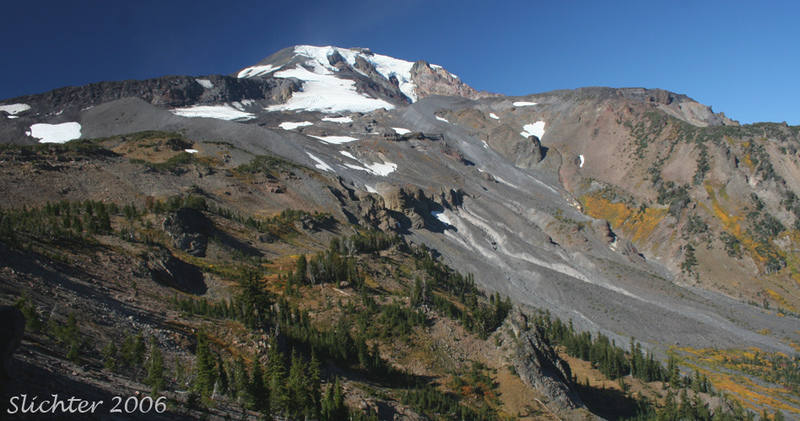 October 13, 2006: Bird Creek Meadows (accessed via the Cold Springs Trailhead & the Round the Mountain Trail #9) and the climbers trail along the crest of the ridge to the south of Hell Roaring Meadows. Crooked Creek Falls. This photogenic site can be accessed from either Bird Lake or from the Round the Mt. Trail #9 at the west end of Bird Creek Meadows. It is about one-half mile downhill from the Round the Mt. Trail. Photographed August 13, 2006. To avoid shadows and harsh lighting, it is best to photograph this site early in the morning (it faces southeast) or on days with a light overcast. This photo shows an early season view down into Hellroaring Valley and north to the Ridge of Wonders and Little Mt. Adams (red cinder cone) from the Hellroaring Viewpoint on the first day that Bird Creek Meadows was open to the public.................July 16, 2006. The loop trail up to this viewpoint from Bird Creek Meadows was still quite snowy (about 1-2 foot snow drifts) at this point. The photo above shows a late season view up towards the Mazama Glacier and the east side of Mt. Adams from the Hellroaring Viewpoint. Photographed October 13, 2006. The orangeish vegetation is probably Sitka mountain ash (Sorbus sitchensis var. grayi).